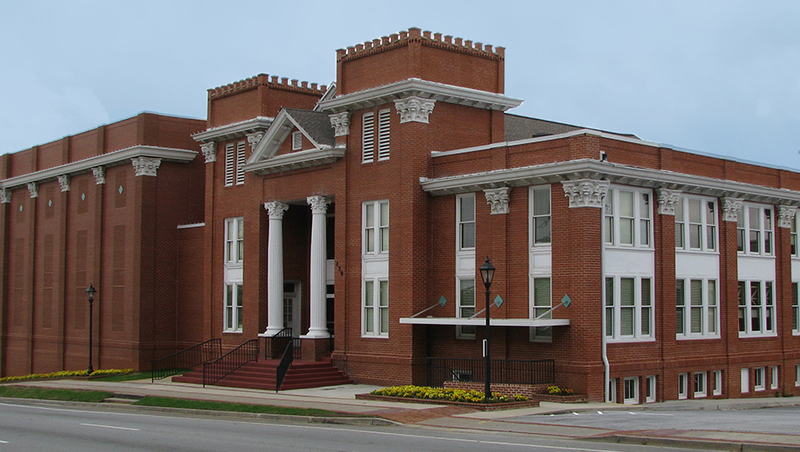 Last Saturday night, I had the privilege of venturing out of my comfort zone and into the small, quaint town of Lawrenceville, Georgia. I've lived in Lawrenceville before - for almost two decades, in the 1980s and 1990s...but I had not been back to this small town since the revamping of the historic town square. One of the wonderful and welcome additions made to Lawrenceville's town square was the addition of the Aurora Theater. The Aurora Theater sits quietly and perfectly inside an old historic church building. This gives the theater just the right amount of character and charm. The theater is small and intimate. I was going to see and review the musical Memphis. Memphis is a spectacular show that maybe many of you have seen in different venues over the years. 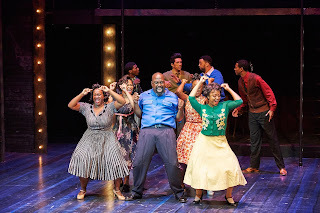 It is set, of course, in the city of Memphis, Tennessee, in the 1950s, a time of racial unsettling and abuse. The story revolves around Huey Calhoun and Felicia Farrell. Huey, played by North Carolina School of the Arts graduate, Travis Smith, is a young white male who lands a job at a local radio station. The interesting story line here though is that before landing the gig, Huey has met and fallen head over heels in love with Felicia. Now, here's your twist in our story - Felicia, played by Atlanta resident Naima Russell, is a Beale Street black R&B singer, and what ensues over the next few hours is their story - life, love, and the turbulent time of racial diversity in the 1950s. It is a love and rise-to-fame story laced with energy, excitement, and abuse. We watch as Huey rises to the top of the ratings chart, taking Felicia with him as he introduces her to a whole new audience of white, American teenagers. We watch as music executives find and "discover" Felicia and, in turn, offer to make her a national superstar. We watch as our couple eventually make life-altering decisions - decisions about about their personal and business relationships. It's the 1950s, and this musical doesn't give us the happy ending we'd all like to see. It's real and it's raw, and it's reflective of life as it used to be. 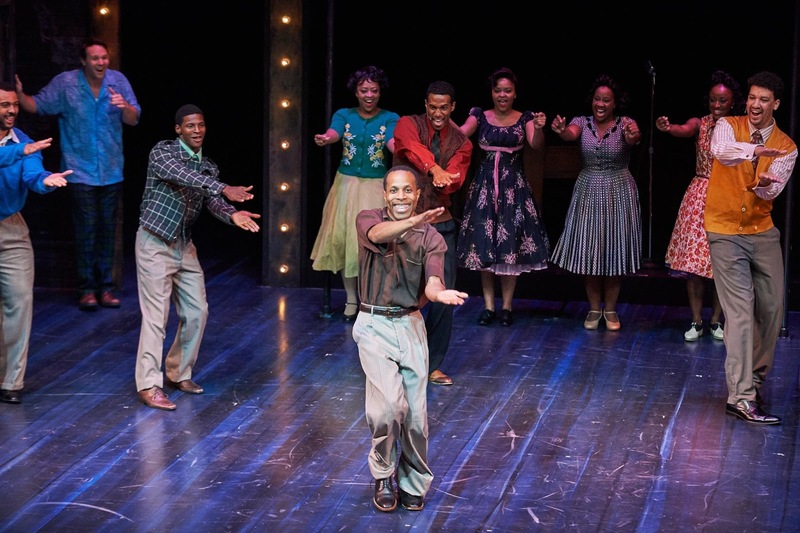 But no matter how turbulent our Country was (or still may be) during the 1950s, its greatest gift to us was the music it birthed, and the music of Memphis reflects this. Songs such as, "The Music of My Soul" and "Everyone Wants to Be Black on a Saturday Night" are perfect examples. Here is "The Music of My Soul" from the Tony Awards a few years ago. Not the same talent of course, but a tease of what you will find at the Aurora Theatre through the month of August. Wow. Just watching this makes me want to go back for a second time! Eric Moore as Bobby. Fabulous! The Aurora Theatre's small setting also provides for high-energy vibrations, close encounters, and audience participation. Our audience members yelled out their support and encouragement (or disdain) to the characters, clapped and sang along to the songs, and even rose to their feet to celebrate. 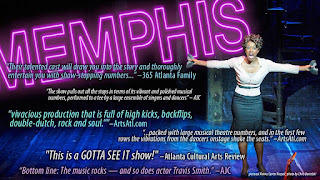 Memphis plays the Aurora theater in Lawrenceville through August 30. Tickets are available by calling 678.226.6222 or visiting the theatre's website. Tickets start out at $20. Last word? Make a date with your significant other, your best friends, or even your children to go and see Memphis while it is in town. Such great music and such great lessons to be learned.